Here we are – almost December as I write this newsletter, lots of snow and keeping with the year that was, more interesting weather. This past week was no acceptation and I guess it was predictable, does Agribition cause bad weather or does bad weather cause Agribition? And what a week it was, our lovely little raffle filly PRR Itza Coosino Bar from the Painted River Ranch was a fantastic ambassador for the Paint horse breed – looks and conformation are not even half of this little ladies charm. She spent her week out and about where the public could pet her and see what a great mind she has. Her stall door was left open with just a rope tie most of the time because she was always ready for attention from the kids. Even if more then half of them thought she was a cow. It was a great week, thank you to everyone who sold or purchased tickets, dropped by or took the time to chat and catch up on you and your horses. Lots of hopeful people were waiting for the call Saturday evening. The lucky winner, Shelly Fouhse from White City, had a hard time believing she won. Her husband Rob was our very first customer Monday morning. Rob said they did not need anymore horses and told me the deal was if they won, I was to come and get two of theirs. I reminded them when we made the winning call, but so far the numbers in my pasture have not increased. Thank you to Director Karen Kotylak for all your hard work again this year at Agribition, Karen was again working from set up to tear down this year. Thank you to our volunteers during the week, Bruce and Laura Martin from Painted River Ranch, Audra who skipped out way to much school to help out and to Morgan, Dallas and Logan who also skipped some school. Your help was much appreciated. Shelly Fouhse was the winner of the raffle filly, PRR Itza Coosino Bar. She is lead at her new home by Tyrel Fouhse. The SPHC has started making plans for its 2011 show season, yet we haven’t even finished reporting on all the events that occurred at the Harvest of Colours show. One of the highlights in 2010 was the $1000.00 Exhibitor Draw. For each horse that entered a class (paid an office fee) and whose owner was a SPHC member, a number was put in the draw. When the draw was held, the lucky winner was Lynsay Atchison. The SPHC wants to congratulate Lynsay on her win, but also wants to thank Lynsay for coming out to the Show. For anyone that doesn’t know her, Lynsay is a dedicated exhibitor of her beautiful Solid Paint Bred horses. It takes a lot of dedication to haul to shows not knowing whether there will be a point class. Lynsay and her mares are a shining example of why more people need to get out there and show those solids. The SPHC Annual General Meeting will be held in Saskatoon on January 15, 2011 (location and time will be posted on the website). The meeting will be a great opportunity to share ideas about how we can encourage more SPBs to come to the shows. The meeting is also your opportunity to share your comments, suggestions and even constructive criticism is welcome, with the Board. We also will be having our year end awards at this time so hope to see you out. Congratulations also go out to Angie Morrow who this past month went to The Paint Horse Worlds. Most of us sat and watched her ride live on our computer monitors, it was quite exciting for one of our own to get so far! The following is a write up on Angie. When you are younger, you usually have a dream. A dream of becoming a princess, or a cop. 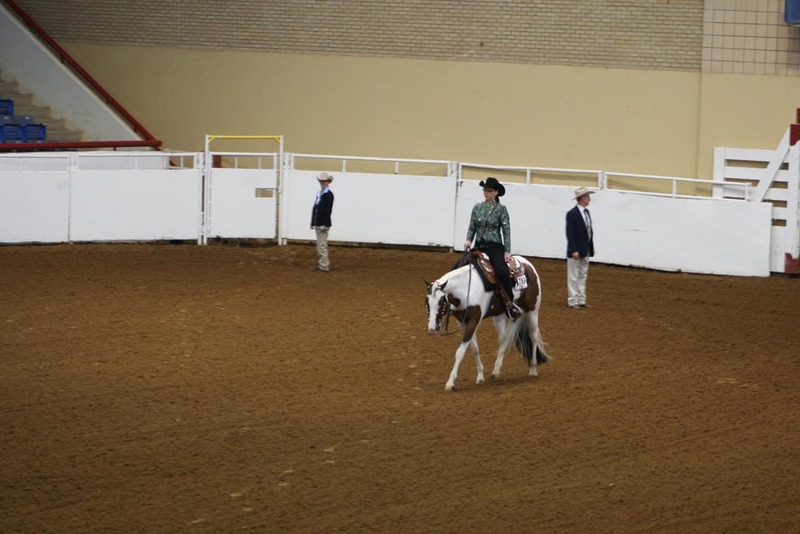 For Angie Morrow it was competing at the American Paint Horse Association (APHA) World Show. Little did she know that her dream, was going to become a goal, and that goal was achieved on November 3, 2010 when her plane landed in Fort Worth, TX. But the road to the World Show didn’t start there, it started March 14, 2007 when Angie saw a picture of a bay tovero filly on Valley Vision Paints website, owned by Matt and Lisa Baxter. This filly was by Hes Got The Assets and by Lisa’s APHA Open and Youth Champion mare, PP Emerald Chip. She was only hours old, but the moment she saw the picture Angie knew that she was going to be “her” horse. Fate brought the pair together and a month after the filly was born, named Assets and Emeralds aka: Katie, Angie added her to her herd! Angie and Katie hit the show ring with a vengeance. Katie winning the Big Sky Futurity in Bozeman, MT in August of 2007, and then coming to Canada and winning the Weanling Fillies Stake class at the Harvest of Colors in Moose Jaw, SK. As a yearling Angie showed Katie in yearling lunge line and yearling trail in hand, they received their Register of Merit (ROM) in yearling trail in hand that year and a few points in lunge line. The pair didn’t stop there. As a 2 year old, Katie was sent to Mark Gilmore in Bellingham, WA for her training. Their first show was in August, and Angie and Katie made their debut in Nampa, Idaho, where Angie was only able to have two rides on Katie before showing her and went in and put on an awesome ride. They showed what a good partnership was while they were down there. Then, they came up to Canada where the pair won the 2009 CCF 2 Year Old Western Pleasure Futurity, and were the Reserve Non-Pro Futurity winners. Also, they were the Reserve Non-Pro Futurity winners at the Harvest of Colors. They also earned their ROM in Novice Amature Western Pleasure, which for a 2 year old, and having limited time as a team was one of Angie’s greatest accomplishments with her mare! In 2010, the pair was the APHA Zone 1 Novice Amature Western Pleasure Champions bring home their first buckle! Let’s not think that was an easy ride up to this point, it meant dedication, determination and teamwork. Angie flew or drove out to Bellingham, WA where Katie has been staying with the trainer for the past year, at least once a month. Sometimes that meant flying out on Friday evening, riding Saturday and early Sunday and flying back. It was worth it, as it helped the partnership grow and mature. November 8th was show day at the World Show. For four days Angie and Katie practiced, and perfected what they needed to do. They rode in the arenas that Angie only dreamt of riding in. It has finally become a reality. It is an amazing experience to be at the show, and to be a competitor its even more amazing. Angie and Katie were in the first class of the day, Novice Amateur Western Pleasure. There were two cuts, and the pair were in the first cut, they only called back 8 riders to go into the finals. You have to go down a chute before you enter the arena, and as Angie waited at the top of the chute she thought to herself, “this is it, this is what I have always wanted to do” and then they jogged into the arena for the first time. All the dreams, all the goals that Angie had were being accomplished just by stepping into the arena, and that is an accomplishment in itself. And if you think waiting in that chute, and jogging down the centre of the arena isn’t nerve racking, you can just ask Angie, and she will tell you that it is! The pair put in a performance good enough to put them into the finals! For it being the pair’s first World Show, making the finals was just icing on the cake! Then, it was time for the final go. They didn’t put in their best ride, but it was still very good for the team. They ended up 16th overall out of 40 competitors in the Novice Amature Western Pleasure. Angie is thrilled to have made it that far, and to make the finals when she was on the youngest horse in the ring, and probably the youngest horse and rider combination out there is just thrilling to her! They also competed in the Classic Amatueur Horsemanship class. Angie and Katie put in an amazing performance but unfortunately, were too inexperienced to make the finals, but Angie was thrilled with the pattern they had as it was the best pattern to date! Overall, the APHA World Show experience for Angie and Katie was a great one and they cannot wait to see what their future holds, and where they will be years to come! Of course, it wouldn’t have happened without the support from her family, friends and trainer. As we look forward to a new year, I would like to wish you a very Merry Christmas from all of us at the Saskatchewan Paint Horse club, all the best in the upcoming year.